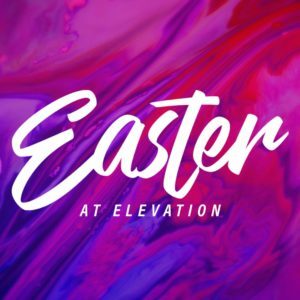 Each Easter at Elevation Church is an incredible celebration! This Easter the entire weekend is filled with events, opportunities and worship experiences. From Friday to Sunday, there will be multiple opportunities for you to bring someone to church! This Easter, you can make a difference in someone’s life by simply inviting them to one of these opportunities! A simple invitation to an Easter worship experience could be a game changer for someone. It’s an amazing thing that although we may know many of our friends are LOOKING for a church to attend on Easter, we still feel nervous when inviting them. That may come from the fact that we all feel a bit nervous when talking about things that are important to us. The truth is, when you invite a friend to join you on Easter weekend they very often will come, and even if they cannot, they’ll appreciate the fact that you thought of them. 1. Everybody is going to spend eternity somewhere. 2. We should NEVER say “NO” for someone. I’ve learned not to say “NO” for that someone that keeps popping up in my mind. You never know what is going on in their life and right now may be the very BEST time to ask them. Too many times, when I really do feel the Lord pressing upon me to invite someone to church, whether it’s a server in a restaurant or someone I have had a relationship with for a while, I want to make the easy assumption and just say “no” for them. However, what I’ve discovered is that a lot of people are just one more invite away from attending church. Seriously! In a recent message, I said that FOUND PEOPLE FIND PEOPLE! It is a truth. We are saved and we are sent. With that in mind…let’s not say “no” for people when GOD IS SAYING “YES” in regards to us inviting them to a worship experience! 3. We are responsible for the ask, we are not responsible for the answer. The same power that brought Jesus back from the dead is living inside of you and I. Check this out, in Christ we can do ANYTHING that He commands us to do! (Philippians 4:13) You just may not be aware of what God is up to. If you have someone on your mind, a person that you cannot stop thinking about every time someone mentions inviting someone to church…guess what? that is mostly likely the voice of God speaking to your heart! It is my prayer that none of us would allow an empty chair to be beside us during our Easter worship experiences. So spend time in prayer asking God who YOU need to invite to an Easter worship experience this year. The staff and I are preparing, praying and believing that it’s going to be the BEST ONE YET!